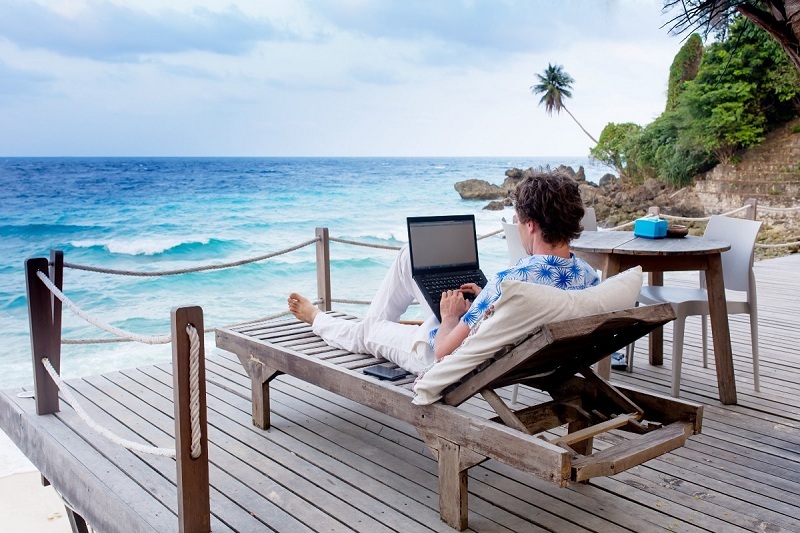 8 Ways to Thrive Your Career as a Digital Nomad! The internet has transcended the way we live our lives today. It provides the means for us to earn from anywhere around the world with the help of the internet. It matters not if you are working from your office, at home or at the park; as long as you are online, you can make your living. By doing all of this, you will be known as a digital nomad. There are no boundaries to where you can work as long as you are able to deliver it before the due dates. But don’t take it the wrong way; being a digital nomad does not mean you roam the world with absolutely no special skills, in fact, it is the opposite. They are experts in their fields and also possess the latest skills required to complete a task. But don’t think that it is all well and good for you. Going out to the unknown world you are still exposed and vulnerable. You will need to know how to navigate the world more safely and here’s how you can do just that. A laptop is our usual instrument of work, but that is not to say that it is the only one that we’ll be using. Mobile devices like smartphones and tablets serve as excellent tools when it comes to portability and convenience. With apps like Dropbox and Evernote, you can write, upload and store any file, document and folder you want and then retrieve it from the screens of your phone. A smartphone from Android or Apple is a wise bet. Be sure that your carrier also has an expensive network that you can take anywhere with you. Also, check if your phone has enough storage to keep the apps you use for your work at hand. Ensure that the apps function right and that your phone as a plan for unlimited bandwidth and data. Security is the first thing that should come to mind for your backpack. You should go for one that is quite fortified. In this case, we recommend you try Pacsafe. It includes wire mesh backpack linings or covers that make it harder for thieves to cut your bag. You may also want to get zipper locks and hidden pockets as well. One of the best things about being a digital nomad is that you can travel the world. The room at home isn’t the only comfort zone you can find. You can basically plan your travels to other cities while settling into the life of a nomad. Since you have no long-term places to stay, you should shop for affordable and furnished housing options in order to travel in comfort. This is also a great option to consider, especially if you’re returning from a recent trip abroad. Aim for the low cost of living. Now what kind of attachments are we talking about here? These are the kind that prevents you from starting a nomadic life. For example, your perfect job, your bedroom, your pet or even your family. Of course, we’re not going to force you into this lifestyle if you don’t want to. So unless you feel like there is nothing to hold you back, the world is your ultimate playground. By continuously exploring the world with your with eyes, meeting so many people along the way and trying out new things, your mind will grow more and more. Not only will you become smarter, but your skills and expertise will also escalate. Being exposed to various lifestyles, cultures and situations do make one that way. Even while traveling the world, digital nomads have to be available for meetings across various time zones. You can save yourself the time and trouble by installing a World Clock widget on your phone. It will set your local time zone and add your current location into it. Your bag is not only your travel companion; it is also your home. So if you want to take it with you anywhere on the globe, you will need to lighten the load. This means letting go of attachments and all that we have already covered. Upon visiting a new place, you have to be quick on your toes and become acclimated to your new surroundings. You also do not know what is cheap, legal to eat and how to converse in the native language. You are also not familiar with the surroundings of the place and which ones are the safe routes. You should always prepare for the unknown as that is what goes into being a nomad. What’s more is that you have to have the courage to look go into the fog of the unknown and navigate your way through it to reach the end. Author Bio: Katey Martin works as a Freelancer and travels around the world. She is always passionate about blogging and uses it to connect to her audience through her Essay Writing Help blog. You can follow her on Facebook | Twitter | Google Plus.